There’s no more beautiful place to experience the benefits of yoga and meditation than beside the sea. We offer public beach yoga classes open to all levels. Bring a large towel (or mat if you prefer), plenty of water and sunscreen, and leave your worries behind for an hour long practice by the ocean. Class schedules vary weekly, are weather dependent, and are held on the public beach at 5th Street East, Folly Beach, SC. Our Folly Beach yoga beach yoga classes are held on the sand at at 5th Street East beach access. Class updates for our outdoor yoga classes will be posted on our Facebook page. Weekend classes are also available indoors upstairs at St. James Gate Irish Pub on Center Street for those that prefer an indoor experience. See our class schedule for dates and times and to purchase tickets. 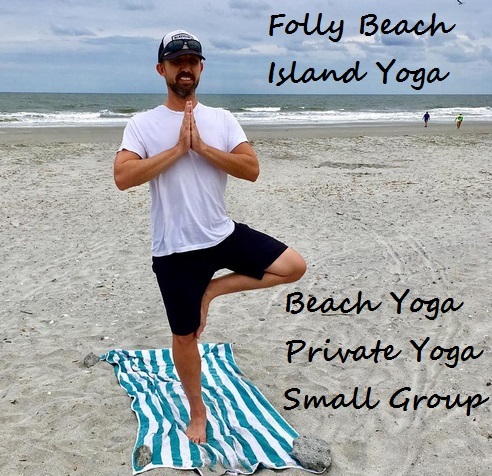 Both indoor and ocean side yoga class options offer a unique and memorable experience for those vacationing on Folly Beach, James Island, Charleston, and Sullivan’s Island, South Carolina. Yoga by the sea is the perfect activity to start or end a beach day. Escape to the everyday grind and visit Folly Beach, SC. We cannot wait to share our practice with you at one of our classes! Updates for weather on our outdoor yoga classes will be posted on our Facebook page. We recommend bringing a towel or two for the beach. 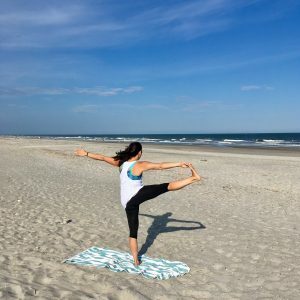 Though you may enjoy layering and putting the yoga mat on top, the towel’s texture really works better on the sand, and is less difficult to clean afterwards.